Aim: NOTES represents an emerging technology, including under its umbrella a variety of approaches and combinations. 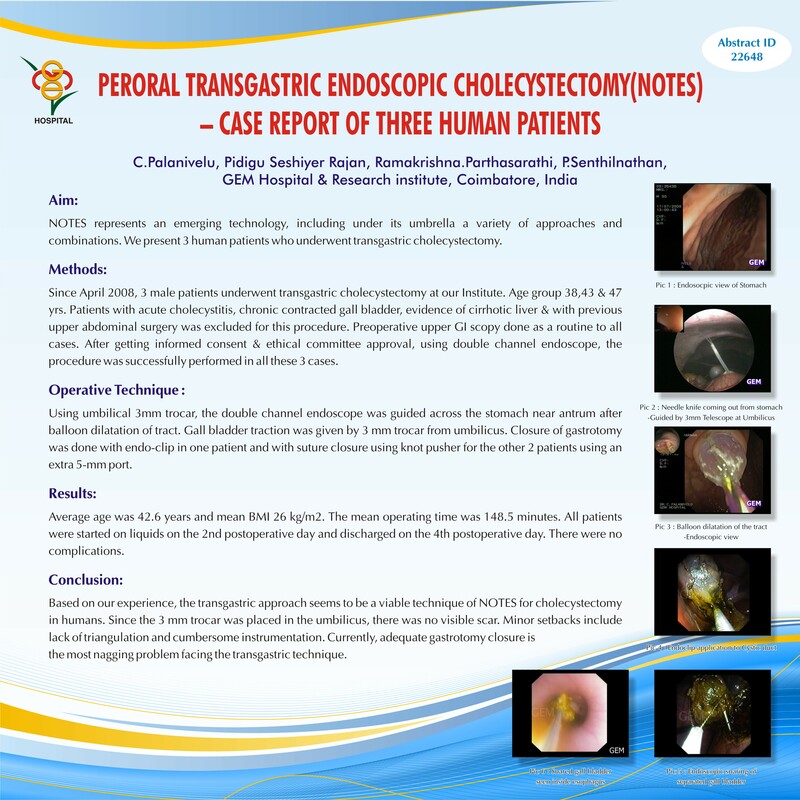 We present 2 human patients who underwent transgastric cholecystectomy. Methods: In April 2008, 2 patients underwent transgastric cholecystectomy at our institute. The procedure entailed the use of a double-channel endoscope, a 3-mm umbilical port for retraction of gall bladder and pneumoperitoneum. Closure of gastrotomy was done with endo-clip in one patient and with suture closure using knot pusher for the other patient using an extra 5-mm port. Results: Average age was 44.5 years and mean BMI 26 kg/m2. The mean operating time was 148.5 minutes. Both patients were started on liquids on the 2nd postoperative day and discharged on the 4th postoperative day. There were no complications. Conclusion: Based on our experience, the transgastric approach seems to be a viable technique of NOTES for cholecystectomy in humans. Since the 3 mm trocar was placed in the umbilicus, there was no visible scar. Minor setbacks include lack of triangulation and cumbersome instrumentation. Currently, adequate gastrotomy closure is the most nagging problem facing the transgastric technique.